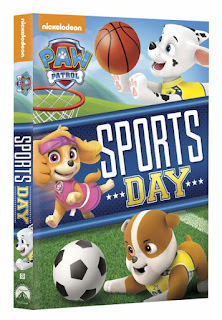 Top Notch Material: Paw Patrol: Sports Day Released Today! Paw Patrol: Sports Day Released Today! Summer means being outside, doing activities and for some even playing sports! That's certainly true of the Paw Patrol, so today they just released Paw Patrol Sport's Day. My three year old, being the little Paw Patrol fan that he is, just loves this and has enjoyed all of the wild and crazy antics that the pups have created in this DVD. If you, and your little one have been home all summer awaiting kindergarten or pre-school to start back up, you might want to invest in this DVD to make the last few days at home more peaceful!